Twitter has been a big part of my life lately. If you would have asked me four months ago what I thought about Twitter I would have adamantly responded, "I hate Twitter." And I did. In fact, I remember speaking at an event and someone specifically asked me if I found any value in Twitter and I had to honestly say,"Not yet." My love for Facebook clouded my objectivity towards Twitter. I believed I couldn't have a separate but equal relationship because Facebook was where I primarily have found most of my business success. I was dead wrong. After that fateful speech where I recognized that I had not truly researched Twitter enough to find its value, I decided I would do my due diligence. I read tons of blogs on Twitter, I set a Google alert for Twitter marketing trends, and I listened to my marketing mentors explain how they used Twitter to effectively reach their audience. I often publicly speak on the topic of shifting your thoughts to impact your world, so I am always willing to admit when I have a thinking error. I have since quickly changed my thoughts about Twitter. I decided to pull away from Facebook and Pinterest and dedicate fifteen minutes a day to Twitter. Twitter is a totally different animal than Facebook and herein lies the problem. You can't possibly keep up with all of the total strangers who will start following you and Twitter is completely hit and miss. Unless you set it up properly. The key is to make sure when you follow someone that you truly want to keep up with is that you put them in a list. Lists can be public or private, and you can organize all of your followers and all of the people that you follow in a list. I have a list consisting of close friends, fellow writers, marketing gurus, and even a list of my favorite local restaurants. When I want to get updates on what is trending in marketing, I quickly look at tweets from people in my marketing list. If I want to see if there are any specials happening at my favorite watering holes, I can see those tweets in a matter of seconds. Finding people with common interests is easy. Just use the hashtag (#) to identify people who may be fun to follow. For instance, I like #entrepreneurs #speakers #writers, etc. You can block spammers who send you stupid Direct Messages or DM's by clicking on the User Actions tab and clicking block user. I have realized that although Twitter may differentiate itself from Facebook in that total strangers can see your posts, it actually opens up unlimited opportunity to randomly connect with anyone in the world. I just had a conversation with an author from Israel via Twitter. I also had a follower send me a link to a classic car for sale on eBay after I posted a picture of a hot rod I loved but didn't know the make or model. I have also converted followers into clients by just being friendly on Twitter. It's important to weed the spammers out of your stream and this includes the uber-annoying tweeps who follow people and then unfollow them the next day. 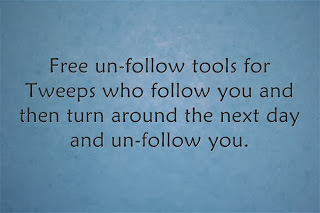 I love the free tools that tell you who follows you and then whether they unfollow you or not. You can then return the favor. 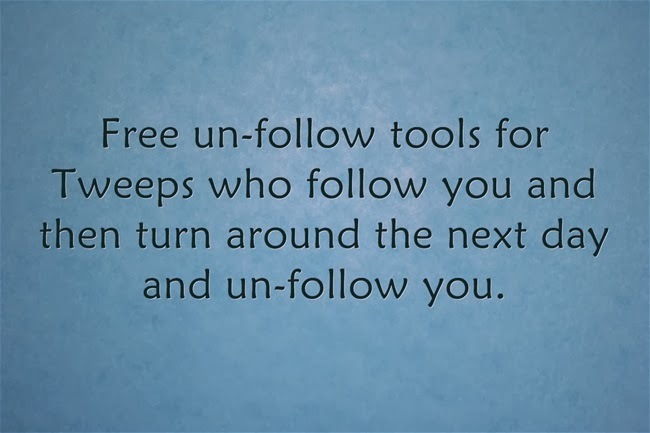 Visit Manageflitter and Justunfollow to get this accomplished for free. All in all, I am now sorry that I didn't give Twitter a chance much sooner. My teenagers are telling me that Twitter will soon trump Facebook; I have learned to listen to them as they have not been wrong yet in predicting social media trends. The beauty of Twitter is that you can talk about your blog posts, your business, or your product every hour and it's totally ok. If you did that on Facebook you'd probably lose all of your friends! Give Twitter a shot, you might be surprised at how much it can do for you. Want to connect on Twitter? Follow me by clicking here.